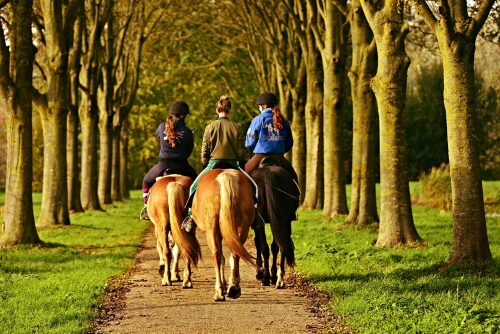 Everyone makes mistakes when they first start learning to ride a horse, after all, it’s part of the learning process – but there are a few really common beginner mistakes which you should try to avoid when you are starting out. We have compiled some of the most common mistakes which novice riders make when they first get into the saddle to help you identify them and make sure you don’t repeat the pattern when you start out. As humans our instinct is to hold out our arms and hands to regain balance and a common mistake among novice riders is to hold their hand position way too high up in the air, often at shoulder level. This makes the reins way too long and makes it impossible to control the horse. The other common error is to let your reins slip through the hands and then to grab on with hands rather than just shortening the reins up. Try to keep your hands and reins in the correct position at all times as it will give you more balance and control. If you grip your horse with your upper or lower legs to help your balance, it could send signals to your horse to move forward when that isn’t what you want to do. Constantly gripping the horse with your legs will also become incredibly tiring very quickly and will make your body very tense your horse could also pick up on that tension and react accordingly. When you are first learning to trot many riders try to hop themselves out of the saddle by rising up onto tip toes and hopping out with their shoulders hunched. This will put you out of the horse’s rhythm and only lead to you bouncing around very uncomfortably in the saddle. It will also cause discomfort to your horse. Another common one for new riders is trying to push your feet too far forward into the stirrups. You need to be wearing the right footwear and have your feet correctly positioned. Shoving your feet as far as you can through the stirrups is not only uncomfortable but it could prove dangerous too. Another common error is to hunch down while riding, so hunching shoulders or almost curling into a ball, which can seriously affect your balance. When you are not balanced properly it makes the horse’s job much harder as well so make sure you sit upright in the saddle. A common posture mistake most new riders make is to sit in the saddle as if they are sitting in a chair so with the knees pulled up and heels up, or feet shoved through the stirrups. You need to adopt the correct riding position. Horses will often move their heads and new riders are sometimes not prepared for that, allowing the reins to slide through their hands – this leaves them with no control over the horse at all. The next mistake is to compensate by lifting their hands up high to try to get the reins back. Learning something new requires concentration and can be scary so many beginners find themselves tense and holding their breath. It’s important to be relaxed and to breathe evenly as horses are sensitive animals and will pick up on, and react to, tension in your body. If you pull too hard on the reins you are telling the horse to stop, even if your body and legs are saying go and this can become very confusing for the horse. Also, pulling too hard for a period of time will lead to the horse ignoring your commands because they won’t know what you want them to do and they might even start to become aggravated due to the pain in their mouth. When riding for the first time it can be tempting to keep looking at the horse if you are nervous, but this will send you off balance and make the horse’s job harder – you need to keep your eyes focussed on where you are going, not on the horse. This is one of the most important tips for any beginner – you should never make the mistake of getting on a horse without wearing the right gear. You need to have a riding helmet which fits you perfectly and the right footwear as well. Trying to ride in trainers, with no helmet, is the worst mistake you could ever make.